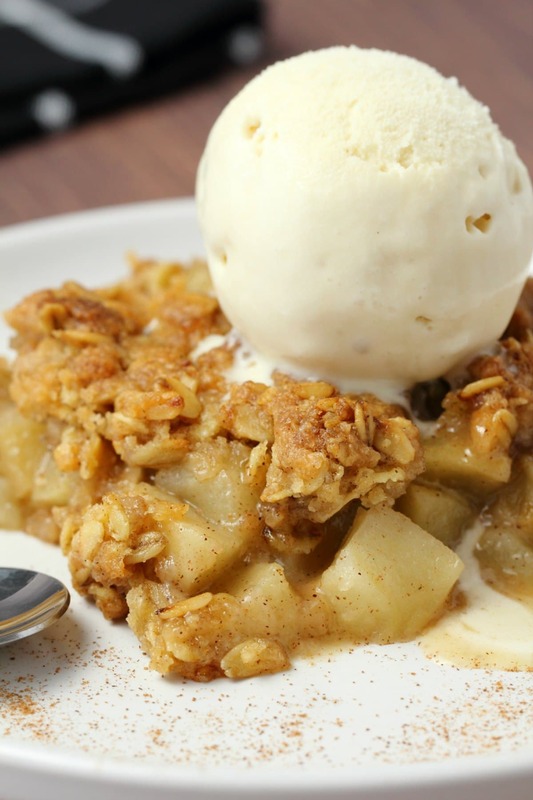 This vegan apple crisp is totally divine served warm with vegan cream or vegan vanilla ice cream. It’s deliciously flavorful and perfect for the holidays. So first I made vegan apple cake and then I made vegan apple crisp. All in a bid to avoid making vegan apple pie! Hahaha, no I joke, I will get to apple pie (one day) and this vegan apple crisp is absolutely no slouch and isn’t second to anything. In fact Jaye is already saying this is going on the Christmas menu. 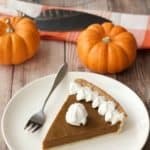 For everyone celebrating Thanksgiving on the other side of the world, this is another perfect dessert idea. 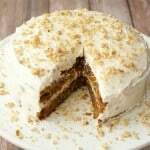 Along with our vegan pumpkin pie and vegan apple cake of course. Or why not all three? Some vegan pineapple upside down cake wouldn’t go amiss either! Peel and chop up a bunch of apples so that you end up with 8 cups of peeled, cubed apple (about 2.2lb/1kg). My apples were really small so I had to use a whole crapload of apples (like 13 of them)! This is really the most time consuming part of the whole dessert making process. And I think you know that peeling and chopping apples is really easy, so I hope you’re getting the idea that this is a super easy dessert, because it is. Toss up the chopped apples with some brown sugar, flour, cinnamon, nutmeg, salt, lemon juice and vanilla and toss until well coated. Then smooth down into a 9×13 baking dish (spray it with non-stick spray first). Then you mix up your topping. You can use the same bowl as you used for your apples. See? Easy one-bowl recipe. Add flour, rolled oats, brown sugar and cinnamon and mix together and then pour in some melted vegan butter and mix in. Then all you have to do is spread the topping over the apples. Use your fingers for this, crumbling the topping between your fingers so that it lands in little clumps and crumbles of topping and spreads over the whole top of the dish. This will be totally divine once baked. And then you bake it for 50 minutes. 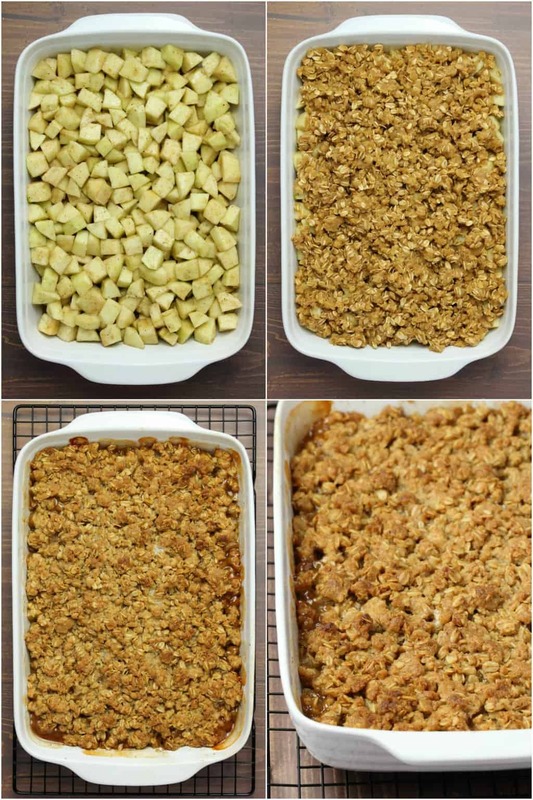 The topping will be golden and crispy and the apples will be baked to perfection! When you take it out of the oven it will be all bubbling up the sides, this is perfect. Granny Smith apples work great in this recipe. They have a lovely tart/sweet taste and are really firm so they hold up very well when baked and don’t just turn into total mush. I like to cut the apples into cubes for this dessert because I find that also holds up best with baking. I tried a version where I cut the apples into slices instead of cubes and they didn’t hold up as well, it was still totally delicious, but it was a little more mushy. 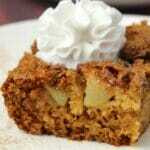 I like being able to see some intact cubes of apple even once this apple crisp is baked and you get that with cubes. You definitely want to serve this hot with a scoop of vegan vanilla ice cream! The ice cream you see here is our vegan vanilla ice cream recipe. The only change I made to that recipe was to omit the vanilla powder because I didn’t have any on hand, so I used vanilla extract only. 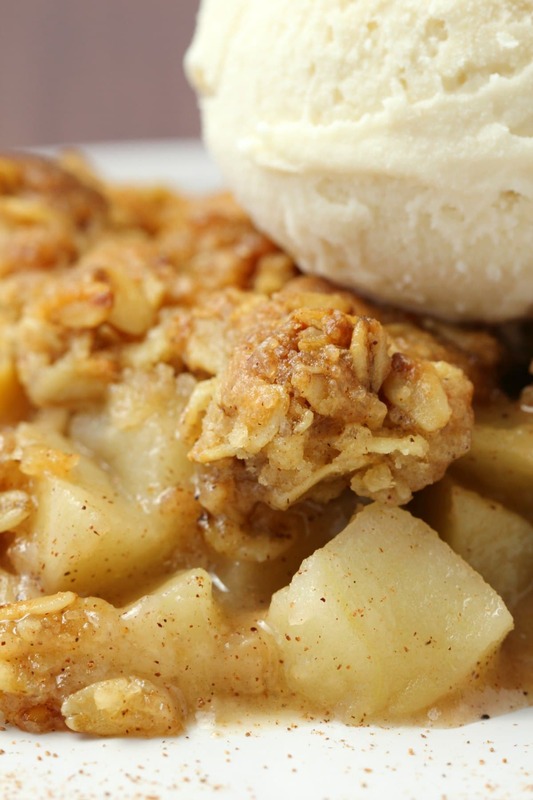 It is the perfect pairing for this apple crisp. If you don’t want the hassle of making ice cream from scratch then use any store-bought variety, but I think vanilla is going to be the best flavor pairing for this. 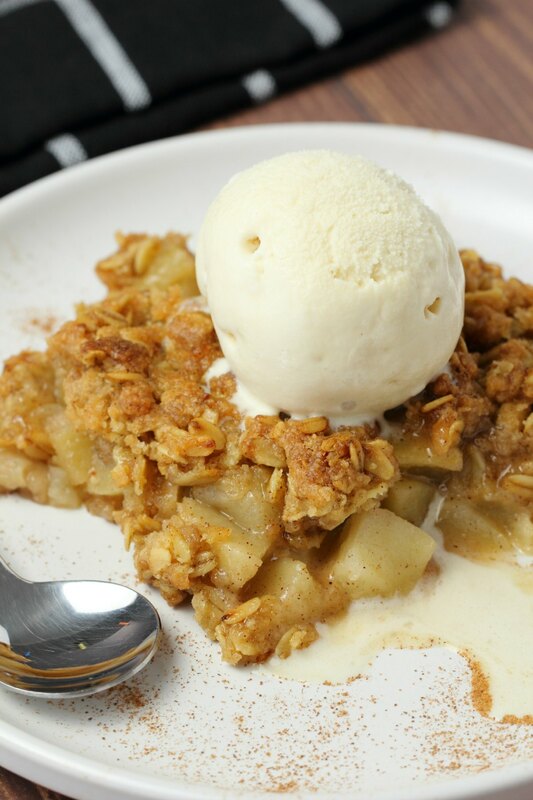 The apple crisp is served hot, the ice cream is cold, it gets all melty and it’s pretty much heaven in your mouth. Alternatively you can serve it with vegan whipped cream. Also completely divine with this. Yes my friends if you want to make this gluten-free I definitely think you can. I haven’t had a chance to test it like this yet, but a simple switch for a gluten-free all purpose flour blend will be the way forward. Also make sure you use gluten-free rolled oats. I don’t foresee any more changes to this recipe other than those simple switches to make this vegan apple crisp gluten-free friendly. Keep leftovers covered in the fridge and reheat a slice as required. 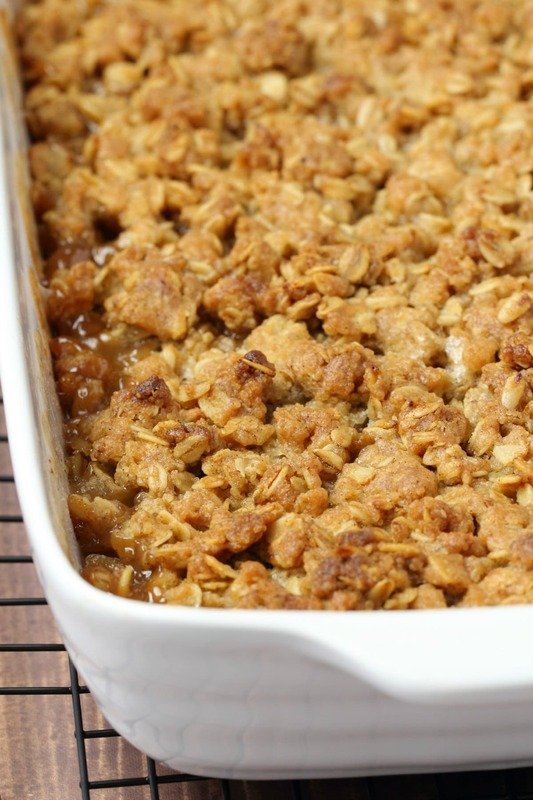 Let us know what you think of this vegan apple crisp in the comments and please rate the recipe too! Thanks so much. And before you go, sign up to our email list, you’ll be the first to know when new recipes are posted to the blog and you’ll get an awesome free recipe ebook as well (with 10 delicious vegan dinner recipes). 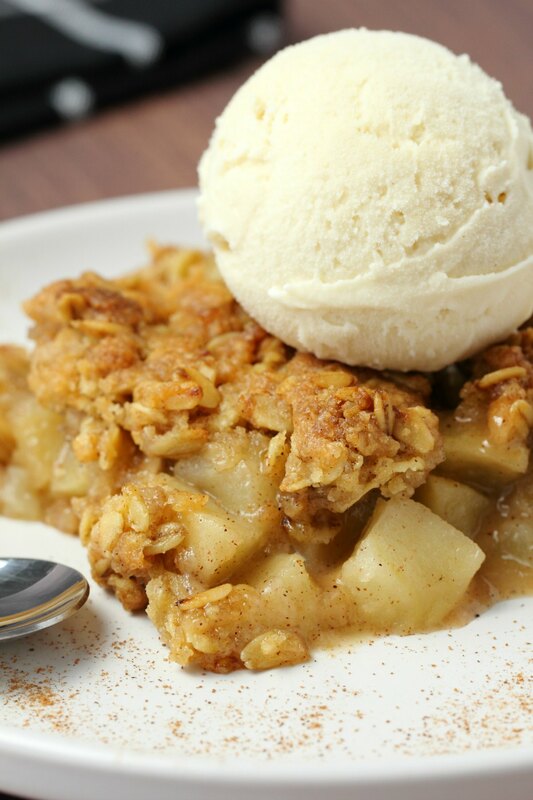 This vegan apple crisp is totally divine served warm with some vegan cream or vegan vanilla ice cream. It’s deliciously flavorful and perfect for the holidays. Peel and cube the apple and add to a mixing bowl with the brown sugar, all purpose flour, cinnamon, nutmeg, salt, lemon juice and vanilla extract and toss together so that all the apple pieces are coated. Transfer the apple mix to a 9×13 dish sprayed with non-stick spray and smooth down. Prepare the topping. 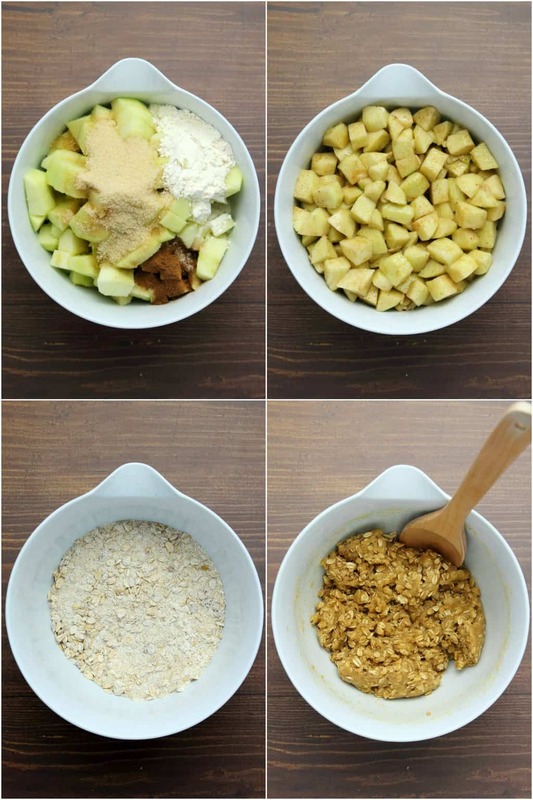 Add the all purpose flour, rolled oats, brown sugar and cinnamon to the mixing bowl and mix together. Then add in the melted vegan butter and vanilla and stir in. Use your fingers to spread the topping over the apple layer, crumbling it with your fingers until it is evenly spread across the top. Place into the oven and bake for 50 minutes until the top is nicely golden brown and the apple mix is bubbling up the sides. 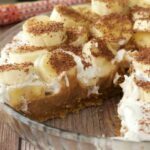 Serve with vegan vanilla ice cream or vegan whipped cream. *The weight for the apples (2.2lb/1kg) is after peeling and coring and chopping into cubes. *Nutritional information does not include ice cream. Looks delicious! 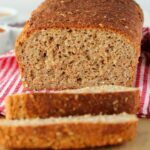 Can’t wait to try it just wondering if I can use oat flour instead of regular flour and if maple syrup would work instead of brown sugar? You can try with a gluten-free all purpose flour blend as discussed in the post, I’m not sure about just using oat flour. Maple syrup wouldn’t be a good swap as it’s a wet ingredient, it needs to be a granulated sugar. Noted… would coconut sugar work? And if so what ratio ? I would love to make a smaller version of this. If I cut the recipe in half, do you think I could use an 8×8 pan? Cook for less time? 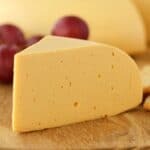 Also, I am new to vegan butter, but my daughter is vegan and I would like to make this for Christmas. I need to weigh to 170grams, not just measure in a measuring cup? Sorry for all the questions! The recipe looks delicious! Hi Alison, thank you so much for your prompt response and suggestions. I will be sure to rate it after I’ve made it. I like this recipe because it is simple. Baking is not my strong suit, but this dish was easy enough and super tasty. I used coconut oil instead of vegan butter just because it’s what I had in the cupboard. It may have had a little more of a classic apple pie taste with the butter, but it turned out delicious with the coconut oil as well. My boyfriend has devoured it, so I’ll assume he agrees. I can’t belive this recipe. Taste like apple pie! I ate it for breakfast/dessert for three days and I still want more! 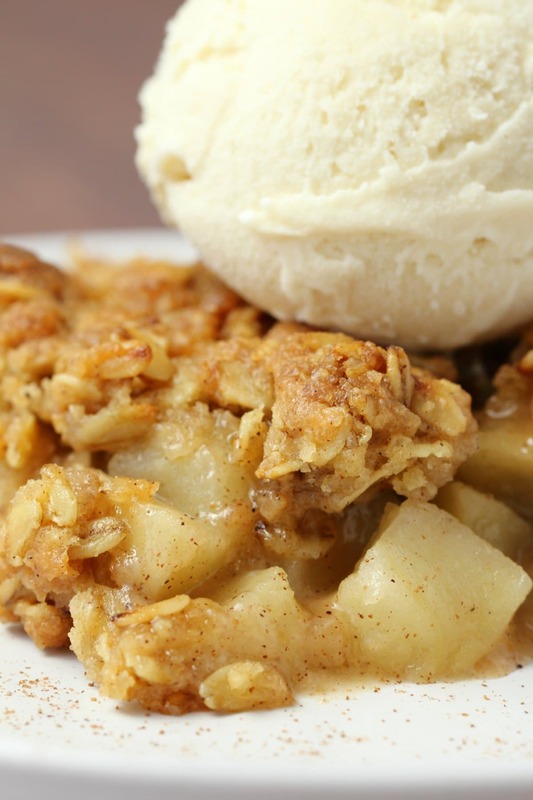 I have been looking for a good vegan apple crisp recipe since the fall. 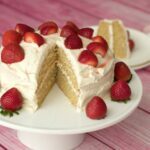 Some recipes I tried lacked flavor, had a disappointing topping, were too watery or the recipe was just too healthy resulting in a bland result ; you need to indulge a little! 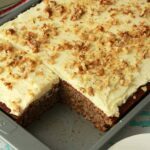 This is the 4th recipe that I have tried and I am looking no more : this is it! 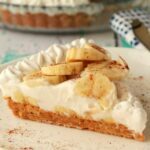 It is decadent, rich in flavors and tasty, all of what i was looking for! I will cut the nutmeg in half next time but this is the only tweak that i am thinking.